Many of you have seen the advertisements from ReadyMan for their Hostage Escape Tool on your social media feeds over the last year or so. If not, and you follow me on Twitter or Facebook, you’ve seen my complaints about how long it takes for ReadyMan to deliver on your purchase when you buy one. Well, they arrived a couple of weeks ago and I did a full test and evaluation of the product. What follows are my observations and recommendations. First, an explanation of ReadyMan and their sales tactics. They replied twice over a two week period. Oddly enough, both emails claimed that my items were shipped that morning. Since they didn’t arrive for another week, I have no idea if either of the emails were accurate. I received my tools about two months after purchase. It may have been longer because after a while I forgot about them. I ordered 5 because I fully intended to conduct this T&E and expected to destroy a couple of them in the process as I tested their durability. Now, a word about the tool itself. I wanted to state that the concept behind this tool is very solid. The designs included are useful and satisfy a variety of needs in a survival scenario. There are a variety of problems with these tools and we will go over them in detail but I did want to tell you that the “idea” behind them is pretty impressive. The execution is where the problems arise. As you can see from the photo above, the Hostage Escape Tool is just about exactly the size of a standard business card. Hansen Restoration can thank me for the free plug later. It fits in your wallet just like a credit card would or can be easily slipped into a pocket, purse, or even a sock or shoe. The size and concealability are a good mark for this tool. As illustrated in the series of photos above, the pieces snap out of the tool with a little back and forth movement. Removing the pieces is not difficult and doesn’t require any exceptional strength or dexterity. This is mostly due to the very thin material from which the card is manufactured. 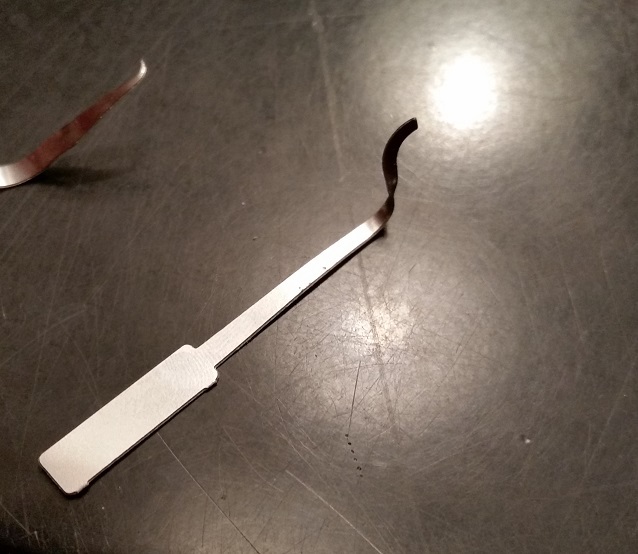 I didn’t have the opportunity to actually measure the stainless steel’s thickness but, for comparison, here is a photo of the ReadyMan Tool lock pick against a standard lock pick. The comparison lock pick is a standard Southord pick found in their affordable and reliable pick sets which range from around $16 to $40, depending on the number of picks in the set. I know it is difficult to see in this photo but if you zoom in you can see that the Readyman pick is less than half the thickness of the Southord pick. Therein lies the problem with this set of tools. 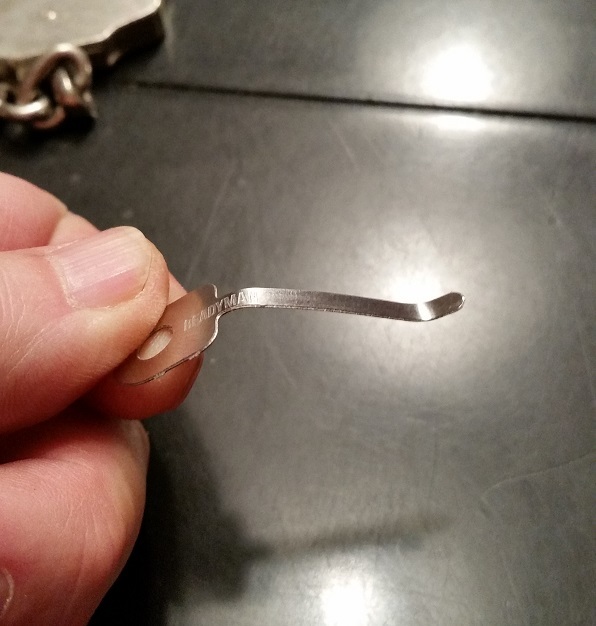 In the photos above you can see that the first tool I removed from the card was one of the “handcuff shims.” Well, below is what it looked like following the first attempt to actually shim a set of handcuffs. The pointed tip of the second shim gives it the opportunity to twist and turn in odd directions resulting in a corkscrew effect. It was difficult removing the tool from the handcuff after that happened. In both cases, the shim failed to open the handcuff. It isn’t possible for me to teach you how to pick locks in this brief post. Why do you want to pick locks anyway? What are you up to? Anyway, it isn’t as hard as most people think. Mostly because they watch too much television and never actually look at a lock. As one of my first investigations trainers explained to me many years ago, “Locks keep honest people out. For crooks, they are a minor nuisance.” Think about it for a moment. When you come across a locked door, you immediately assume you shouldn’t be in there and walk away. A crook will just kick it in and go about their business. And don’t be fooled by cost and fancy titles. At the National Training Center, I taught soldiers how to pick large, heavy, official government expensive padlocks with a paperclip and pieces of an ink pen. Oddly enough, the more expensive locks that are machined to a higher degree of precision are actually easier to pick. You cannot shim handcuffs that are “double locked,” which actually just means “locked” because there is only one “lock” on a handcuff. Where the term double-locked came from I don’t know. I just know it is silly. If you have never been handcuffed, here is how they work – the cuff wraps around your wrist and slips into a ratchet-like mechanism that only travels in one direction without use of the key. It isn’t “locked” it is just applied to your wrist. If you continue to press the cuff it will still move in that one direction and tighten around your wrist. If you fall with handcuffs in this condition you can seriously injure your wrists. Therefore, there is a “lock” on the cuffs that prevents the cuff from moving in EITHER direction. That way they can’t tighten and injure the person. That “lock” has to be defeated prior to shimming the cuff. This can be done with a variety of items but the easiest for illustration purposes is a “hook” type lock pick. (one comes with the Escape Tool) They come in various lengths and are sometimes referred to as “Single pin Picks” because they can be used to set one lock pin at a time. 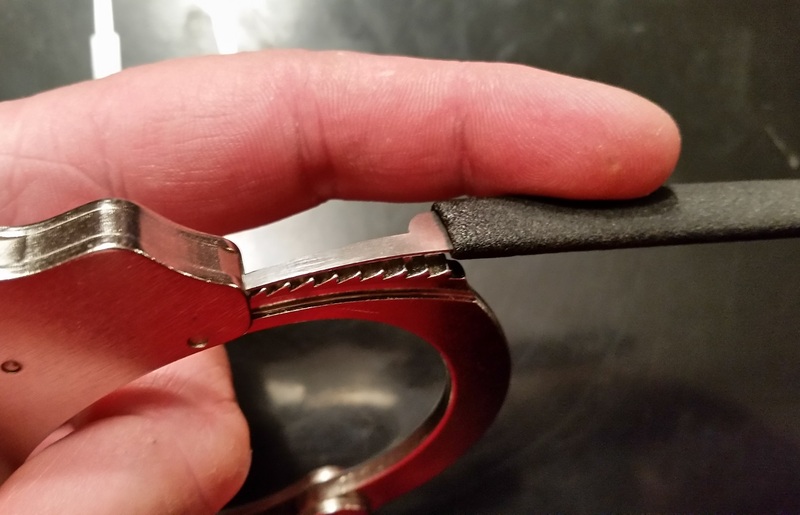 Above is a photo of the pick style and approximate angle needed to unlatch the “lock” on handcuffs. Once this lock is open, you can shim the cuff, as shown below. 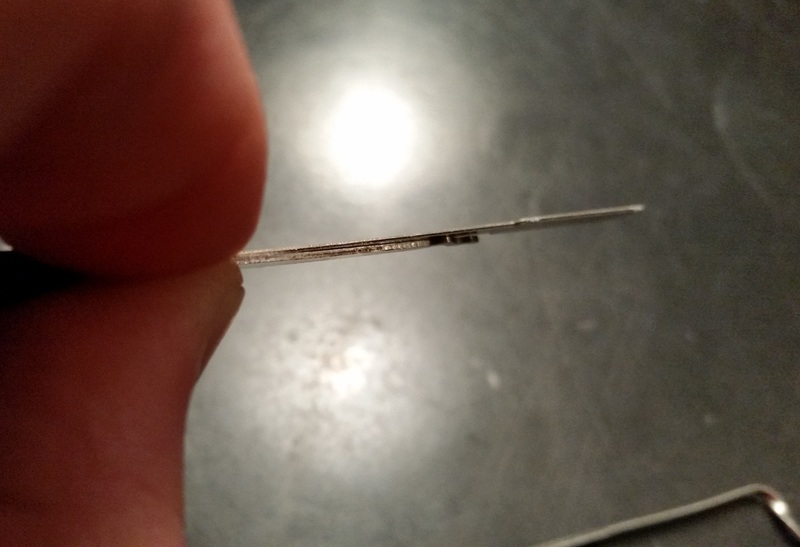 I used an old pick that had its tip broken off, leaving a flat tip. Once the shim is inserted, you can pull open the cuff with the shim holding open the mechanism, as shown below. Piece of cake, right? Okay, it takes some practice and patience but it is the simplest method and easily mastered. So, you know there is a “catch,” right? It can’t be that easy, can it? Hell no! Now you have to practice doing all of that while you are actually handcuffed… behind your back. Good luck. Get back to me once you’ve mastered that. You see, the trick to handcuffs is not that they are impossible to pick or defeat, it is that they are virtually impossible to pick or defeat with your hands behind your back. If they are properly applied, (yes, there is a proper way) and they are properly locked, it takes a skilled magician to get out of them sitting on the ground with your hands behind your back. That is, IF they are properly applied. We won’t go into all of those details here because, again, this isn’t a lesson in lock picking and escape. I went through all of that to show how it is done with reliable tools. The ReadyMan tool simply isn’t durable enough to withstand most of those actions. 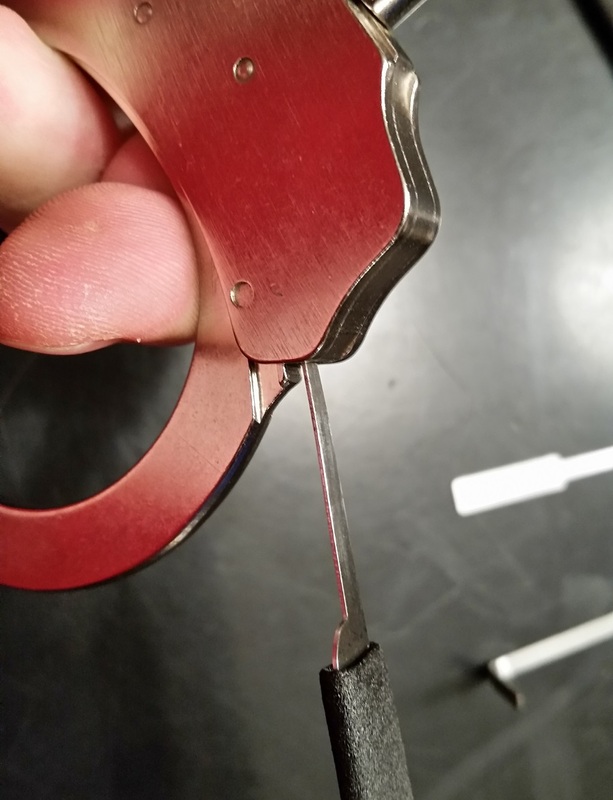 I WAS successful in using one of the ReadyMan shims to open a set of cuffs but I had to be very gentle with them and slowly work them into the lock instead of treating them like an actual lock pick set. Unfortunately for the average user, discovering this AFTER you have destroyed the tool does nothing to aid in your escape. These tools are dainty, little things that will not take much abuse without bending or breaking. I suspect that in a real escape scenario you will not be thinking about how gentle you have to manipulate the tool designed for your escape. 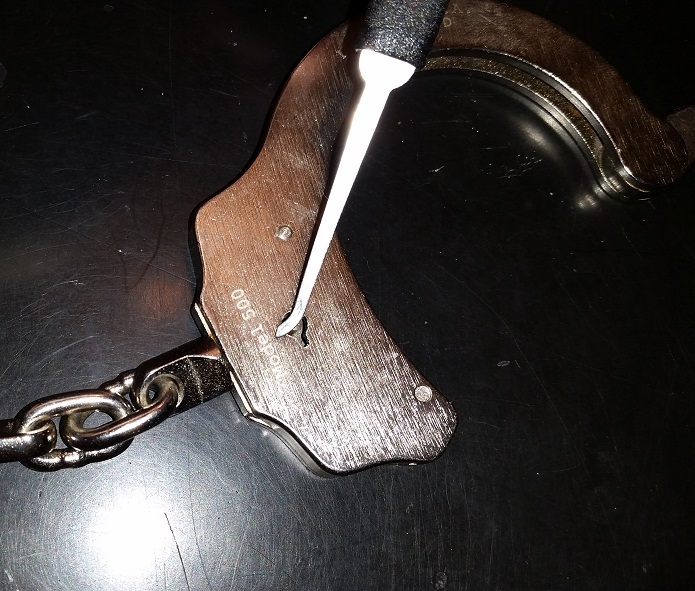 A hook pick can also be used to simply manipulate the lock mechanism of handcuffs. The hook goes in one direction to unlock the cuffs, then is removed, turned in the other direction, and rotated around to simply open the cuff in the same fashion as the key. When I attempted this with the hook pick in the ReadyMan tool, I got the result shown below. The tool was not durable enough to withstand the twisting and pressure necessary to manipulate the cuff lock using the keyway. This is doubly disappointing once you realize a standard paperclip is typically strong enough to do the job. In fact, a variety of everyday items will work in this way. Again, it just happens to be virtually impossible to do if applied properly and behind your back. If you don’t believe that part, try getting out of properly applied cuffs WITH THE CUFF KEY. It will open your eyes to how difficult it will be using any other implement. There are some successes with this Escape Tool that I must mention. The simple lock rake and saw blade do work as you would expect. Again, they are not durable but if you know this going in, they will perform as advertised. Using the rake pick and tension tool I was able to pick several standard padlocks with relative ease. From the above photo you can tell they are very small tools. Holding them in order to use them was the hard part while picking the padlocks. If you have large hands and fat fingers, like me, it will be a challenge. Since raking a lock is a straight inward and outward motion, there is less of a chance of ruining the tool when used for this purpose. Those just learning the art should not practice using these tools. You will twist them and break them. Get yourself a legitimate lock pick set and learn with those. 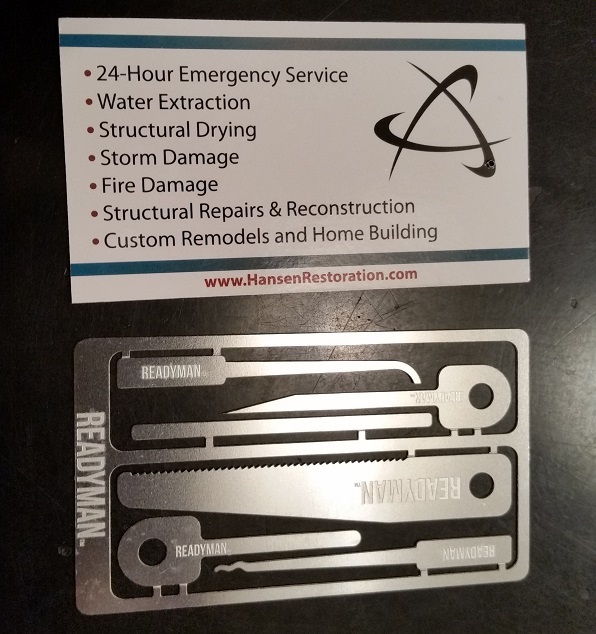 Then the ReadyMan tool can be your emergency tool. 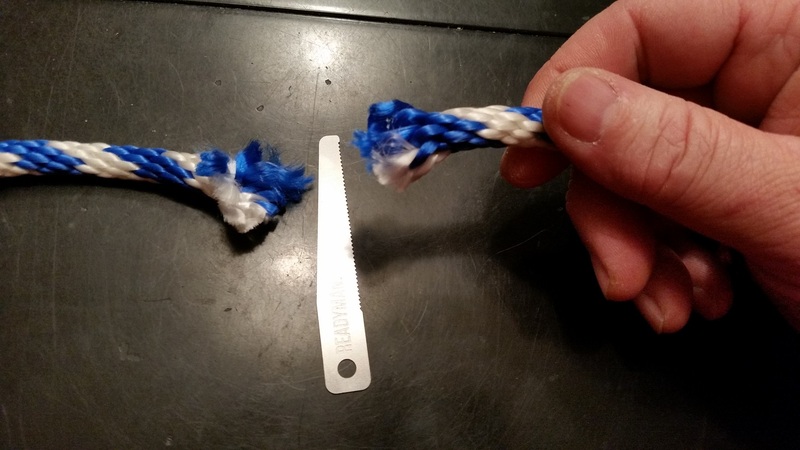 The saw blade cut through this common rope in a few seconds. All in all, this mini saw blade may be the most useful piece of the kit. Bottom line, if you are held hostage, still have your wallet, and can get to it, remove the card, pry out some useful tools, pick your handcuffs, cut the rope around your ankles, and pick the padlock keeping you in the room, all while your hands are behind your back, blindfolded, and possibly injured…. well, you might find this tool useful. Is it worth the $2.95? I suppose so, if you can stand all the spam in your mailbox. But, I highly recommend buying several of them if you decide to purchase. That way you will have some to destroy while you learn how to use them and understand their limitations. If ReadyMan were to produce these from stock that is double the thickness currently used, I would pay $6 for it and possess a lot more confidence in its ability to aid me in a time of need. As is, it is just a novelty item – a neat thing to show your friends. You could easily trim a quality pick set down to a similar size and conceal them in a similar fashion and at least have the confidence that they will work when you need them. The choice is yours. Thanks for the honest feedback Ross! We are diligently working on getting our ship times decreased. Right now we are looking at 2-4 weeks for fulfillment. You are correct on practicing before using the card (we give the option to buy up to 5). The card becomes much more useful when people rehearse the skills needed to shim cuffs, pick locks and shim zipties/cuffs. But my policy has always been order small and if that gets screwed up, then I am happy that I did not spend bigger bucks. I ordered several items from China the same day and all of those items came in. Oh and Geek from China also sells credit card lockpicks. Thanks for doing this review, Ross. I had seen the ReadyMan kit a few weeks ago, and almost pulled the trigger. Now I’m glad I didn’t. 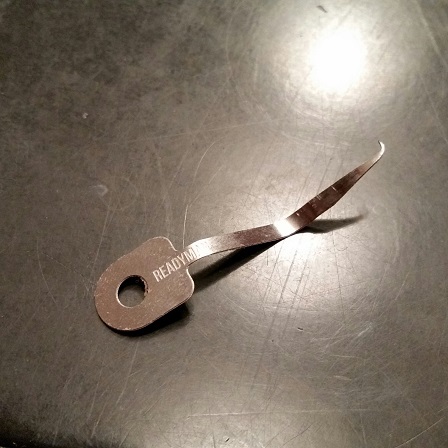 For what it’s worth, I believe the item you refer to as a “pointed shim” is actually supposed to be what is commonly referred to as a “quick stick”, and is intended to be a bypass tool for filing cabinets, padlocks, etc. The idea is that the tool bypasses the cylinder/pins entirely, and directly acts upon the locking dog or tailpiece. 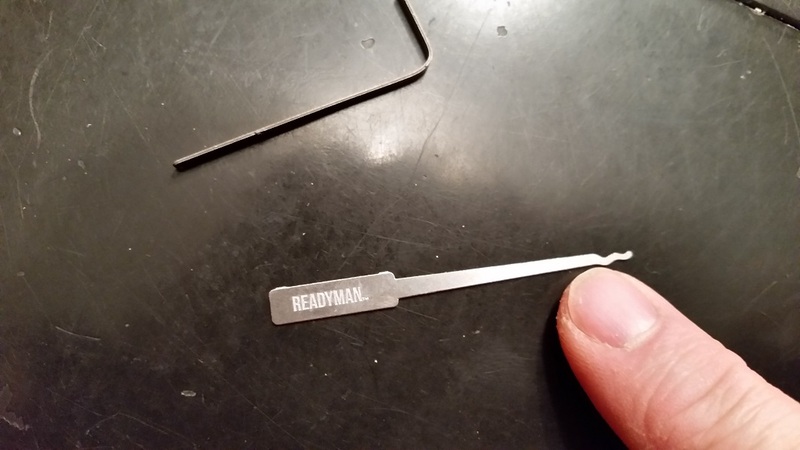 I’ve never tested the ReadyMan kit, so I have no idea if the tool would work any better for this purpose than as a shim, but it might be worth trying. Looks like it might also be put to service as a decoder for briefcase-style combination locks, in which case extreme thinness would be a virtue. Also, I wonder if the type of steel used would make a difference. 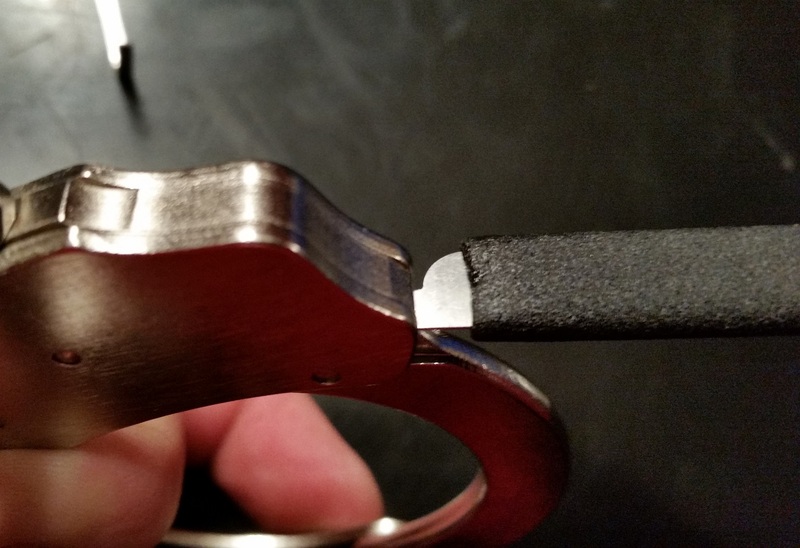 I’ve successfully shimmed handcuffs using a modified single-edge razor blade, which is obviously made of a tempered/spring steel, and extremely thin (thinner even than the ReadyMan kit, I’m betting). Perhaps this entire toolset could be significantly improved just by manufacturing out of a different material, while keeping the current thin profile. Even if the price doubled or tripled, I’d gladly pay that for a tool that works as advertised. If they hardened the material, yes, it would be a world-class item, I think. As I said, the concept is great and has great potential. The metal is just too soft in its current version. Just as a warning…. I bought one for myself, and one for my husband. I never even received them, but a month later was charged for TWO memberships I wasn’t even aware of. What a scam! Too bad I didn’t read this first. I ordered the pick set and the info I was able to see said it hasn’t even been shipped 4 days later. I haven’t gotten any emails from them to join anything but I emailed them just now. Even tho the Internet page said it wasn’t shipped yet someone responded quickly saying it was shipped the next day, Utah to California takes 3 to 5 days. It’s been 3 so I will find out if they lied or the Internet saying it wasn’t shipped was correct.